Courtesy MOCA. 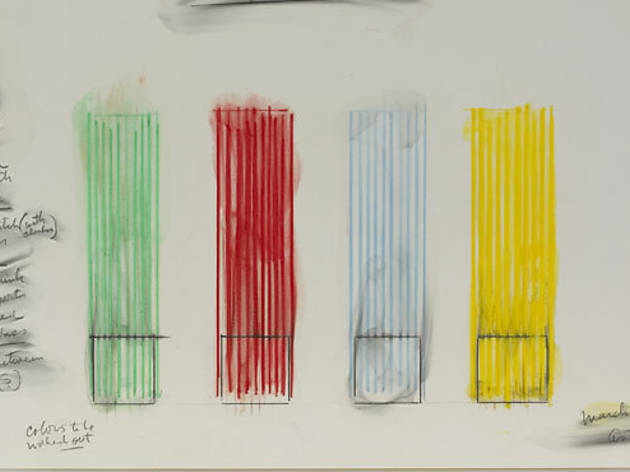 Stephen Antonakos, "Large Unit Neons," 1967 Graphite, colored pencil and fixative on 2-ply plate-finish paper. Shoes. Quirky cat figurines. Psychotic ex-lovers. Everyone collects something. For Dorothy and Herb Vogel, it was art. 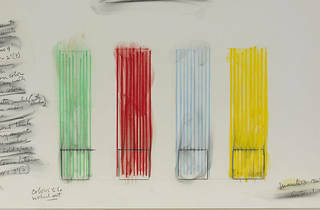 The couple, who married in 1962, worked as a librarian and a postal clerk, respectively, devoting the bulk of their income to acquiring unique works of art, mostly drawings, that they'd like to live with. Over their 50-year marriage, the New York-based couple amassed a collection of more than 4,000 pieces. In 2008, the couple gifted 50 pieces to each of the 50 states, choosing MOCA as the California institution. On view at MOCA are a selection of works that showcase not only a range of post-war drawings, sculptures and paintings from artists like Carl Andre, Stephen Antonakos, and Richard Tuttle, but a personal collection by a couple who put art and culture above personal comforts.